Two players from the San Francisco Bay Area won titles Monday in the Little Mo Nationals in Austin, Texas. In an all-Bay Area final, fourth-seeded Madeleine Jessup of Menlo Park beat unseeded Ria Bhakta of Saratoga 6-1, 6-3 in the girls 9s. Also, Alexander Chang of Berkeley defeated Louis Cloud of San Antonio 6-2, 6-3 in the boys 11s. Both players were unseeded. Finishing third were unseeded Ethan Quinn of Fresno in the boys 10s and top-seeded Rudy Quan of Roseville in the Sacramento region in the boys 8s. Unseeded Nicholas Throgmorton of Foster City placed fourth in the boys 9s. Dedric Ray of Oakland reached the quarterfinals in the boys 11s. Also advancing to the quarters were Anushka Khune of Palo Alto and Pastel Shiuey of San Jose in the girls 10s and 9s. Past champions in the singles-only tournament for ages 8-11 include Andy Roddick and Ryan Harrison. Collin Altamirano, 18-year-old Sacramentan -- Career-high No. 733 in singles (+8), career-high No. 874 in doubles (no change). Bradley Klahn, 24-year-old former Stanford star -- No. 124 in singles (-2), No. 143 in doubles (-6). Scott Lipsky, 33-year-old former Stanford star -- No. 33 in doubles (no change), unranked in singles. Mackenzie McDonald, 19-year-old Piedmont resident -- No. 626 in singles (+2), No. 577 in doubles (-1). Dennis Novikov, 20-year-old San Jose resident -- Career-high No. 411 in singles (+6), No. 459 in doubles (+77). Sam Querrey, 27-year-old San Francisco native and former Sacramento Capital in World TeamTennis (2012-13) -- No. 38 in singles (+2), No. 64 in doubles (no change). Matt Seeberger, 30-year-old Los Altos resident -- No. 525 in doubles (-1). Dmitry Tursunov, 31-year-old resident of Folsom in Sacramento area -- No. 107 in singles (-31), No. 177 in doubles (-28). Kristie Ahn, 22-year-old former Stanford star -- No. 712 in singles (+15), No. 732 in doubles (+18). CiCi Bellis, 15-year-old resident of Atherton in San Francisco Bay Area -- Career-high No. 257 in singles (+54), career-high No. 864 in doubles (+3). Hadley Berg, 18-year-old resident of Greenbrae in San Francisco Bay Area -- No. 964 in doubles (no change). Mallory Burdette, 23-year-old former Stanford star -- Injured, unranked in singles and doubles. Alexandra Facey, 21-year-old resident of Cameron Park in Sacramento area -- No. 758 in doubles (+4). Kat Facey, 21-year-old resident of Cameron Park in Sacramento area -- No. 758 in doubles (+4). Nicole Gibbs, 21-year-old former Stanford star -- No. 92 in singles (-2), No. 588 in doubles (-56). Michaela Gordon, 15-year-old resident of Saratoga in San Francisco Bay Area -- Career-high No. 713 in singles (+38). Lejla Hodzic, 28-year-old former Stanford standout -- Career-high No. 748 in doubles (+4). Raquel Kops-Jones, 31-year-old San Jose resident and former Cal star -- No. 12 in doubles (-1), No. 831 in singles (-2). Maria Sanchez, 24-year-old Modesto product -- Career-high No. 82 in doubles (no change), No. 258 in singles (+11). Karina Vyrlan, 16-year-old Sacramentan -- No. 803 in singles (-1). Allie Will, 23-year-old San Mateo native -- No. 150 in doubles (no change), No. 500 in singles (-2). Carol Zhao, 19-year-old Stanford sophomore -- No. 297 in singles (-1), No. 531 in doubles (no change). Paris (men), quarterfinals, 6-10 a.m. (live), 11:30 a.m.-3:30 p.m. (live), 3:30-11 p.m. (repeat). Paris (men), semifinals, 6:30-11 a.m. (live), 5-10 p.m. (repeat). Sofia (women), semifinals, 11 a.m.-3 p.m. (delay), 3-5 p.m. (repeat). Paris (men), final, 6-8 a.m. (live), 1-3 p.m. and 5-7:30 p.m. (repeat). Sofia (women), final, 11 a.m.-1 p.m. (delay), 3-5 p.m. and 7:30-9:30 p.m. (repeat). Collin Altamirano, 18-year-old Sacramento resident -- No. 741 in singles (-1), career-high No. 874 in doubles (+6). Bradley Klahn, 24-year-old former Stanford star -- No. 122 in singles (-2), No. 137 in doubles (+4). Mackenzie McDonald, 19-year-old Piedmont resident -- No. 628 in singles (+5), No. 576 in doubles (-1). Dennis Novikov, 20-year-old San Jose resident -- Career-high No. 417 in singles (+7), No. 536 in doubles (+2). Sam Querrey, 27-year-old San Francisco native and former Sacramento Capital in World TeamTennis (2012-13) -- No. 40 in singles (no change), No. 64 in doubles (-1). Matt Seeberger, 30-year-old Los Altos resident -- Career-high No. 524 in doubles (no change). Dmitry Tursunov, 31-year-old resident of Folsom in Sacramento area -- No. 76 in singles (+2), No. 149 in doubles (-13). Kristie Ahn, 22-year-old former Stanford star -- No. 727 in singles (-1), No. 750 in doubles (-5). CiCi Bellis, 15-year-old resident of Atherton in San Francisco Bay Area -- Career-high No. 311 in singles (+112), career-high No. 867 in doubles (+3). Hadley Berg, 18-year-old resident of Greenbrae in San Francisco Bay Area -- No. 964 in doubles (+3). Alexandra Facey, 21-year-old resident of Cameron Park in Sacramento area -- No. 762 in doubles (+2). Kat Facey, 21-year-old resident of Cameron Park in Sacramento area -- No. 762 in doubles (+2). Nicole Gibbs, 21-year-old former Stanford star -- No. 90 in singles (no change), No. 532 in doubles (-3). Michaela Gordon, 15-year-old resident of Saratoga in San Francisco Bay Area -- Career-high No. 751 in singles (+4). Lejla Hodzic, 28-year-old former Stanford standout -- No. 752 in doubles (-1). Raquel Kops-Jones, 31-year-old San Jose resident and former Cal star -- Career-high No. 11 in doubles (no change), No. 829 in singles (+1). Maria Sanchez, 24-year-old Modesto product -- Career-high No. 82 in doubles (-11), No. 269 in singles (+1). Karina Vyrlan, 16-year-old Sacramento resident -- No. 802 in singles (+16). Allie Will, 23-year-old San Mateo native -- No. 150 in doubles (+2), No. 498 in singles (-32). Carol Zhao, 19-year-old Stanford sophomore -- No. 296 in singles (-13), No. 531 in doubles (-1). WTA Finals, round robin, 1-3 a.m. and 4:30-8 a.m. (live), 5-10:30 p.m. (repeat), 10:30 p.m.-12:30 a.m. Thursday (live). Basel (men), early rounds, 9 a.m.-1 p.m. (live). Valencia (men), early rounds, 1-4:30 p.m. (delay). WTA Finals, round robin, 4:30-8 a.m. (live), 5-10:30 p.m. (repeat), 10:30 p.m.-12:30 a.m. Friday (live). Basel/Valencia (men), round of 16, 8 a.m.-1 p.m. (live). Valencia (men), round of 16, 1-3 p.m. (delay). Basel (men), round of 16, 3-5 p.m. (delay). WTA Finals, round robin, 4:30-8 a.m. (live), 5-9 p.m. (repeat). Basel/Valencia (men), quarterfinals, 8 a.m.-1 p.m. (live). Valencia (men), quarterfinal, 1-3 p.m. (delay). Basel (men), quarterfinals, 3-5 p.m. (delay). WTA Finals, doubles semifinal, 9-10:30 p.m. (live). WTA Finals, singles semifinal, 11:30 p.m.-1:30 a.m. Saturday (live). WTA Finals, singles semifinal, 3-5 a.m. (live). WTA Finals, doubles semifinal, 5-6:30 a.m. (live). Basel/Valencia (men), semifinals, 6:30-11 a.m. (live). Valencia (men), semifinals, 11 a.m.-1 p.m. (live), 3-5 p.m. (repeat). Basel (men), semifinal, 1-3 p.m. (delay). WTA Finals, semifinals, 5-11 p.m. (repeat). WTA Finals, doubles final, 1-3 a.m. (live). WTA Finals, singles final, Tennis Channel, 10:30 a.m.-12:30 p.m. and 5-7 p.m. (repeat). Basel/Valencia (men), finals, 6:30-10:30 a.m. (live). Valencia (men), final, 12:30-2:30 p.m. (repeat). Basel (men), final, 2:30-5 p.m. and 7-9 p.m. (repeat). lost to 37th-ranked Martin Klizan in the Valencia Open 500. Sixteen-year-old phenom Stefan Kozlov shouldn't feel too bad about losing to Martin Klizan 6-3, 6-3 on Monday in the first round of the Valencia (Spain) Open 500 on an indoor hardcourt. Klizan, a 25-year-old left-hander from Slovakia ranked No. 37, knocked off Rafael Nadal three weeks ago in the Beijing quarterfinals before losing to Tomas Berdych in the semis. True, Nadal was playing in his first tournament since his shocking loss to 19-year-old Nick Kyrgios in the fourth round at Wimbledon. Nadal, a left-hander with a vicious two-handed backhand, returned from a right wrist injury. While Klizan was advancing in Beijing, Kozlov was making a stunning march to the final of the $100,000 Sacramento Pro Circuit Challenger at the Natomas Racquet Club. He lost 6-3, 6-4 to top-seeded Sam Querrey, who predicted afterward that Kozlov eventually would reach the top 10. He is ranked No. 441 after starting the year at No. 1,081. Valencia marked Kozlov's second main-draw appearance on the elite ATP World Tour. At 15 in July, he fell to Polish veteran Michal Przysiezny 6-3, 6-7 (9), 6-4 in the first round round on grass at Newport, R.I.
Klizan, the 2006 French Open junior champion, won his second career title in Munich in April. Only 15 years old, CiCi Bellis of Atherton in the San Francisco Bay Area won her second $25,000 Challenger singles title in two weeks on Sunday. The unseeded Bellis dominated sixth-seeded Ysaline Bonaventure of Belgium 6-2, 6-1 on an outdoor hardcourt in the McLeod for Health Florence (S.C.) Open. Bonaventure, a 20-year-old left-hander, was ranked No. 219 in the world entering the tournament. Bellis, the top-ranked 18-and-under girl in the world, will improve from No. 311 in the women's singles rankings to about No. 261. She was No. 423 entering the Rock Hill (S.C.) Rocks Open the week before Florence. The 5-foot-6 (1.68-meter), 110-pound (50-kilogram) Bellis stunned 12th-seeded Dominika Cibulkova in the first round of the U.S. Open in August to become the youngest player to win a main-draw match at Flushing Meadows since Anna Kournikova, also 15, in 1996. Bellis also helped the United States win the Junior Fed Cup title three weeks ago in San Luis Potosi, Mexico. The USTA recently announced its 2014 No-Cut Coach All-Star team, including Mark Shahan of Antelope Valley High School in the Sacramento area. The No-Cut Coach All-Star team recognizes 14 exceptional high school coaches throughout the nation who implement a no-cut policy that welcomes all interested students to be a part of their school’s tennis team. The No-Cut Coach All-Star team was established last year. Coaches are nominated by their USTA section. Since 2006, more than 4,000 tennis coaches nationwide have made a commitment to offering a no-cut policy, with some programs including more than 100 players. To register as a no-cut coach or learn more about the program and free registration incentives, visit www.usta.com/no-cut. during the recent $100,000 Sacramento Pro Circuit Challenger. Collin Altamirano has decided that professional tennis can wait. The Sacramentan, last year's USTA boys 18 national champion and this year's runner-up, said recently that he will enroll at the University of Virginia in January as planned. "I just felt like it was going to be good for me," Altamirano, 18, said after practicing with countryman Ryan Harrison during the $100,000 Sacramento Pro Circuit Challenger at the Natomas Racquet Club. "It'll be good to be around a team and see something different." Altamirano said he chose Virginia over USC, UCLA and Wake Forest. "I like the team and the coaching staff the best. I like how (the Cavaliers) are coached and how motivated they are. I like the people on the team. I feel like they're all good guys. I just got along with them really well," Altamirano said. Virginia, coached by Brian Boland, won its first NCAA Division I men's tennis title last year, ending USC's four-year reign. The Trojans regained the title this year, defeating the Cavaliers 5-1 in the semifinals. When the 6-foot-2 (1.88-meter) Altamirano was asked how long he plans to stay at Virginia, he said: "Could be a semester, could be four years. We'll see. I'm just going to enjoy it." Altamirano verbally committed to Virginia in the spring but held out the possibility of changing his mind based on his results as an amateur in pro tournaments. "I had the results," he said. "I did better than the plan was. I just felt there's no rushing it. I didn't want to rush something that's not there. I felt like time is on my side." Altamirano achieved the best win of his life in the first round of qualifying for the U.S. Open in Flushing Meadows, N.Y., in August. He beat then-No. 170 Luca Vanni of Italy 6-4, 6-2 before losing to then-No. 127 Ricardas Berankis of Lithuania 2-6, 6-1, 6-1. In Futures tournaments this year, Altamirano has reached one semifinal and four quarterfinals in singles, and won one title and advanced to one final in doubles. He has struggled in Challengers. Altamirano is ranked No. 740 in the world in singles and No. 880 in doubles, both career highs. Altamirano said he sprained his left ankle in practice at the beginning of September and was "probably 80 percent" during the Sacramento Challenger. He received a wild card in his hometown tournament and lost to fifth-seeded Denis Kudla of Boca Raton, Fla., 6-1, 6-1 in the first round. Last year, Altamirano became the first unseeded player in the 71-year history of the USTA Boys 18 National Championships in Kalamazoo, Mich., to capture the title. Past winners include International Tennis Hall of Famers Michael Chang, Stan Smith and Dennis Ralston. Altamirano trained with Roger Federer in Dubai, where the Swiss star has a residence, for two weeks in December and served as a practice partner for the U.S. Davis Cup team in late January and early February in San Diego. In this year's USTA boys 18 final, Altamirano lost to Wimbledon junior champion Noah Rubin 6-4, 6-3, 6-3. Rubin is a freshman at Wake Forest in Winston-Salem, N.C.
After a few anxious months, the future of the $100,000 Sacramento Challenger appears secure. Tournament director Brian Martinez said recently that although the event has a year-to-year contract with the USTA, he's "confident the tournament will stay indefinitely as part of the three-week swing in Northern California." The Sacramento Challenger, held Sept. 29-Oct. 5 at the Natomas Racquet Club, is preceded by the $50,000 Napa Challenger and followed by the $100,000 Tiburon Challenger. Sam Querrey, who decided to stay in his native Northern California rather than travel to Asia for events on the elite ATP World Tour, swept this year's singles titles. This was the 10th Sacramento Challenger. It has been hosted by the Natomas Racquet Club for the last six years after four at the Sutter Lawn Tennis Club. "Our goal is to make this the biggest tournament (in terms of community support) in Northern California," Martinez said. The Challenger's prize money already is the highest on the USTA Pro Circuit. Martinez landed a presenting sponsor, San Francisco-based Acura of Northern California, for this year's tournament but not a title sponsor. Acura and an anonymous donor from Tiburon put up $25,000 of the Sacramento prize money, and the USTA supplied the rest, Martinez said. Deepal Wannakuwatte withdrew after four years as the title sponsor in August 2013, and the USTA furnished all the prize money for one year only. Wannakuwatte was arrested on Feb. 20 after allegedly defrauding investors of millions in his medical supply businesses. He pleaded guilty to wire fraud in May and is awaiting sentencing. Collin Altamirano, 18-year-old Sacramento resident -- No. 740 in singles (+4), No. 880 in doubles (+5). Bradley Klahn, 24-year-old former Stanford star -- No. 120 in singles (+3), No. 141 in doubles (+14). Scott Lipsky, 33-year-old former Stanford star -- No. 31 in doubles (+3), unranked in singles. Mackenzie McDonald, 19-year-old Piedmont resident -- No. 633 in singles (+7), No. 575 in doubles (+3). Dennis Novikov, 20-year-old San Jose resident -- Career-high No. 424 in singles (+8), No. 538 in doubles (+1). Sam Querrey, 27-year-old San Francisco native and former Sacramento Capital in World TeamTennis (2012-13) -- No. 40 in singles (+8), No. 63 in doubles (-1). Matt Seeberger, 30-year-old Los Altos resident -- No. 524 in doubles (+76). Dmitry Tursunov, 31-year-old resident of Folsom in Sacramento area -- No. 78 in singles (-2), No. 136 in doubles (-2). Kristie Ahn, 22-year-old former Stanford star -- No. 726 in singles (+7), No. 745 in doubles (+7). CiCi Bellis, 15-year-old resident of Atherton in San Francisco Bay Area -- No. 423 in singles (-4), career-high No. 870 in doubles (+6). Hadley Berg, 18-year-old resident of Greenbrae in San Francisco Bay Area -- No. 967 in doubles (+7). Alexandra Facey, 21-year-old resident of Cameron Park in Sacramento area -- No. 764 in doubles (+2). Kat Facey, 21-year-old resident of Cameron Park in Sacramento area -- No. 764 in doubles (+2). Nicole Gibbs, 21-year-old former Stanford star -- No. 90 in singles (-1), No. 529 in doubles (-3). Michaela Gordon, 15-year-old resident of Saratoga in San Francisco Bay Area -- Career-high No. 755 in singles (+5). Lejla Hodzic, 28-year-old former Stanford standout -- Career-high No. 751 in doubles (+6). Raquel Kops-Jones, 31-year-old San Jose resident and former Cal star -- Career-high No. 11 in doubles (no change), No. 830 in singles (+2). Maria Sanchez, 24-year-old Modesto product -- No. 93 in doubles (-3), No. 270 in singles (+2). Karina Vyrlan, 15-year-old Sacramento resident -- No. 818 in singles (+1). Allie Will, 23-year-old San Mateo native -- No. 157 in doubles (-17), No. 468 in singles (+6). Carol Zhao, 19-year-old Stanford sophomore -- Career-high No. 283 in singles (+3), No. 530 in doubles (-3). Stockholm (men), early rounds, 1-5 p.m. (delay). Luxembourg (women), early rounds, 5-9 p.m. (delay). Moscow (men), early rounds, 9 p.m.-1 a.m. Thursday (delay). Stockholm (men), early rounds, 1-5 p.m. (delay). Luxembourg (women), early rounds, 5-9 p.m. (delay). Moscow (women), quarterfinals, 5:30-11 a.m. (live). Stockholm (men), quarterfinals, noon-1:30 p.m. (live). Stockholm (men), quarterfinals, 2-5 p.m. (delay). Moscow (women), semifinals, 10-11:30 a.m., 1:30-3 p.m. (delay). Luxembourg (women), semifinals, 11:30 a.m.-1:30 p.m. (delay). Stockholm (men), semifinals, 3-5 p.m. (delay). Stockholm (men), final, 10 a.m.-noon (delay), 3:30-5 p.m. (replay). Moscow (women), final, noon-1:30 p.m. (delay). Moscow (men), final, 1:30-3:30 p.m. (delay). Millman 6-4, 6-2 to win the $100,000 Tiburon Challenger. The Sam Querrey Show ended Sunday after a three-week engagement. The 6-foot-6 (1.98-meter) U.S. Davis Cup veteran completed a sweep of Northern California Challengers with a 6-4, 6-2 victory over John Millman of Australia at the Tiburon Peninsula Club. Querrey extended winning streaks of 17 matches overall, including two Davis Cup triumphs against Slovakia in Chicago, and 20 in Challengers, including the Sarasota title on clay in April 2012. He will return to the ATP World Tour, the major leagues of men's tennis, next week on indoor hardcourts in Valencia, Spain. By winning the $50,000 Napa and $100,000 Sacramento and Tiburon Challengers, Querrey improved his world ranking from No. 54 to No. 40. Querrey must raise his ranking another eight spots or so to be seeded for next year's first Grand Slam tournament, the Australian Open in January. It isn't a matter of ego. By being seeded, Querrey would avoid the possibility of facing another seed -- perhaps Novak Djokovic, Roger Federer, Rafael Nadal or Andy Murray -- in at least the first two rounds. The top-seeded Querrey lost only two sets during his NorCal sweep, to 18-year-old Elias Ymer of Sweden in the second round at Napa and to Millman in the Sacramento semifinals, and did not face a seed in Sacramento or Tiburon. Querrey, who turned 27 on Tuesday, was born across the bay from Tiburon in San Francisco. He has battled injuries since reaching a career high of No. 17 in 2011. After defeating countryman Tim Smyczek for the Napa crown, Querrey explained why he chose to play in the NorCal Challengers rather than in Asia on the ATP tour. "I was (going to be) in the qualifying of Tokyo and Shanghai, not in the main draw," said Querrey, a Las Vegas resident who has won seven ATP and seven Challenger singles titles. "I don't have a coach right now. David Nainkin and I (parted) ways earlier in the year. I didn't want to go all the way over there by myself. "I just knew that wasn't going to be the right decision for me. I'm comfortable here, there are some USTA coaches here, I've got family and friends here, and it just seemed like a better fit for me." Players ranked 11 to 50 can enter a Challenger, comparable to Triple A in baseball, only via a wild card, said USTA supervisor Keith Crossland. Top-10 players are prohibited from entering Challengers, he added. The unseeded Millman was seeking his fourth Challenger singles title, including Sacramento in 2010. He climbed to a career-high No. 126 in April last year but tore cartilage in his right (playing) shoulder the following month, underwent surgery in July and missed 11 months in all. Ranked No. 591 going into the Napa Challenger, Millman improved to No. 285 after his performance in Tiburon. Querrey is not the only Tiburon champion with ties to the San Francisco Bay Area. Second-seeded Bradley Klahn, a 24-year-old Stanford graduate, and Adil Shamasdin of Canada beat unseeded Carsten Ball and Matt Reid of Australia 7-5, 6-2 in the doubles final. Note: An in-depth profile of the popular Millman, who has had an eventful career, will be posted in the next few weeks. National Championships in San Diego in August. 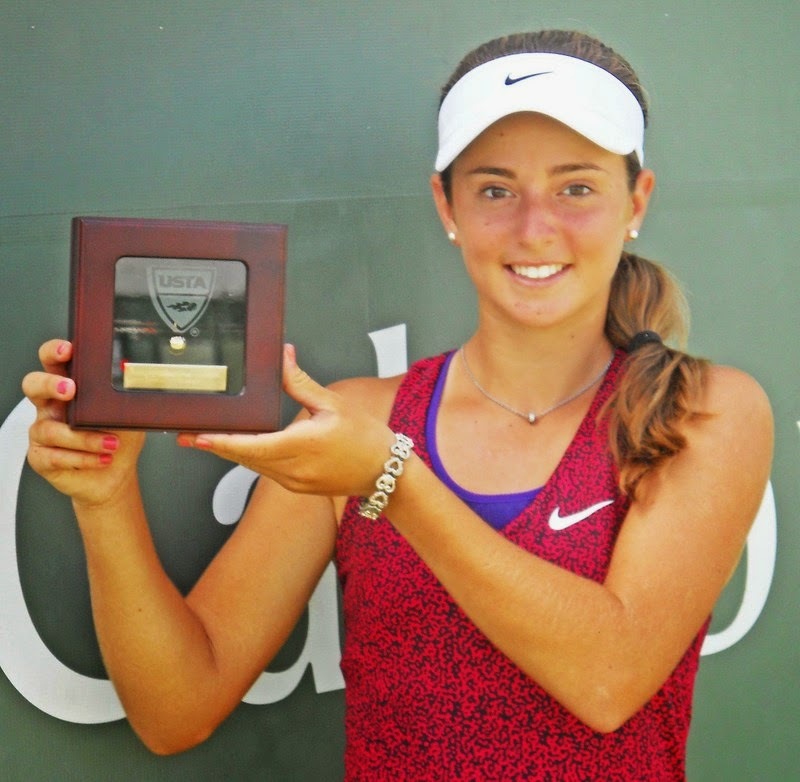 CiCi Bellis won her first ITF Pro Circuit singles title today. The 15-year-old resident of Atherton in the San Francisco Bay Area defeated Lauren Embree of Santa Monica in the Los Angeles region 6-4, 6-0 on a hardcourt in the final of the $25,000 Rock Hill (S.C.) Rocks Open. Bellis' only other ITF Pro Circuit title came in doubles in the $10,000 Orlando (Fla.) Women's Open in March with countrywoman Alexis Nelson. Bellis, the No. 1 junior in the world, will jump from No. 419 in the women's singles rankings to about No. 310. The 5-foot-6 (1.68-meter), 110-pound (50-kilogram) right-hander stunned 12th-seeded Dominika Cibulkova in the first round of the U.S. Open in August to become the youngest player to win a main-draw match at Flushing Meadows since Anna Kournikova, also 15, in 1996. Bellis also helped the United States win the Junior Fed Cup title two weeks ago in San Luis Potosi, Mexico. Embree, 23, was the singles runner-up to Jennifer Brady in the $25,000 Redding Challenger last month and teamed with Brady for her second straight doubles crown in the Northern California city. Embree underwent surgery for torn cartilage in her right hip in January and returned to the circuit in late June. She helped the University of Florida win NCAA titles in 2011 and 2012. Bryans complete set -- Bob and Mike Bryan reached another milestone in their illustrious doubles career, completing the set of nine Masters 1000 titles on the ATP World Tour. No one had done that in singles or doubles. The former Stanford All-Americans beat reigning French Open champions Julien Benneteau and Edouard Roger-Vasselin of France 6-2, 7-6 (3) in Shanghai. The 36-year-old Bryans have won 31 titles in Masters events, the highest level besides the Grand Slams. Only John Millman stands in the way of a Northern California Challenger sweep for Sam Querrey. They reached the final of the $100,000 First Republic Bank Tiburon Challenger by defeating qualifiers on Saturday at the Tiburon Peninsula Club. The top-seeded Querrey dispatched Matt Reid of Australia 6-3, 6-4 in 59 minutes, but the unseeded Millman needed 2 hours, 13 minutes to subdue Nils Langer of Germany 5-7, 6-2, 7-5. Querrey, a 27-year-old native of nearby San Francisco, extended his winning streak to 16 matches since losing to top-ranked Novak Djokovic in straight sets in the third round of the U.S. Open. The 6-foot-6 (1.98-meter) Querrey won two Davis Cup matches against Slovakia in Chicago, followed by titles in the Napa and Sacramento Challengers in the past two weeks. He has not lost a set in his four matches in Tiburon. Millman, a 25-year-old Australian, returned to competition in April after missing 11 months because of shoulder surgery. He trailed Langer by a service break at 1-2 in the second set before reeling off five straight games. Querrey defeated Millman 5-7, 6-4, 6-3 last week in the Sacramento semifinals. Millman led 4-2 in the second set. This will be their second meeting. John Millman, Australia, def. Nils Langer, Germany, 5-7, 6-2, 7-5. Sam Querrey (1), United States, def. Matt Reid, Australia, 6-3, 6-4. Bradley Klahn, United States, and Adil Shamasdin (2), Canada, def. Chase Buchanan and Tennys Sandgren, United States, 3-6, 6-3 [13-11]. Bradley Klahn, United States, and Adil Shamasdin (2), Canada, vs. Carsten Ball and Matt Reid, Australia. Sam Querrey (1), United States, vs. John Millman, Australia (not before 2 p.m.). John Millman took another step in his comeback from shoulder surgery. The unseeded Australian defeated second-seeded Tim Smyczek of Tampa, Fla., 6-1, 5-7, 6-3 on Friday in a quarterfinal matchup of consummate professionals in the $100,000 First Republic Bank Tiburon Challenger at the Tiburon Peninsula Club. Smyczek (pronounced SMEE-check) was coming off a 2-6, 7-6 (3), 7-5 victory over American Jared Donaldson, a 17-year-old wild card, in 2 hours, 27 minutes on Thursday. Millman, meanwhile, had breezed past lucky loser Liam Broady of Great Britain 6-1, 6-2. The 25-year-old Millman, who returned to action in April after missing 11 months, reached the semifinals for the second consecutive week. He lost to eventual champion Sam Querrey in three sets in the $100,000 Sacramento Challenger but soared 120 spots in the world rankings to No. 406. His career high is No. 126 in April 2013. Millman, who will play No. 314 Nils Langer of Germany today, could get another crack at Querrey in the Tiburon final. Langer outlasted fellow qualifier Marcos Giron, who turned pro in June after winning the NCAA singles title as a UCLA junior, 6-4, 1-6, 7-5. Langer avenged a 6-3, 6-7 (9), 7-6 (4) loss to Giron in the last round of qualifying in Sacramento. Millman is 1-0 against Langer, coasting 6-1, 6-3 in the second round of qualifying on clay in Munich last year on the ATP World Tour. Millman, a right-hander, tore cartilage in his right shoulder later in the tournament. In today's other semifinal, the top-seeded Querrey will face qualifier Matt Reid of Australia for the first time. Querrey, a native of nearby San Francisco who lives in Las Vegas, topped unseeded James McGee of Ireland 6-1, 7-5 for his 15th straight victory. Reid outplayed wild card Bjorn Fratangelo of Plum, Pa., 6-4, 7-5. Querrey is ranked 48th, down from his career high of 17th in 2011, and Reid 276th. Nils Langer, Germany, def. Marcos Giron, United States, 6-4, 1-6, 7-5. Matt Reid, Australia, def. Bjorn Fratangelo, United States, 6-4, 7-5. John Millman, Australia, def. Tim Smyczek (2), United States, 6-1, 5-7, 6-3. Sam Querrey (1), United States, def. James McGee, Ireland, 6-1, 7-5. Carsten Ball and Matt Reid, Australia, def. Marcus Daniell and Artem Sitak (1), New Zealand, 6-3, 3-6 [10-6]. Bradley Klahn, United States, and Adil Shamasdin (2), Canada, vs. Chase Buchanan and Tennys Sandgren, United States. John Millman, Australia, vs. Nils Langer, Germany (not before 1 p.m.). Sam Querrey (1), United States, vs. Matt Reid, Australia. Third-seeded Bradley Klahn exited the $100,000 First Republic Bank Tiburon Challenger on Thursday, and second-seeded Tim Smyczek almost followed his fellow American out the door. In a matchup of reigning and past NCAA singles champions from the Pacific-12 Conference, qualifier Marcos Giron ousted Klahn 7-6 (3), 7-6 (1) at the Tiburon Peninsula Club to reach his first Challenger quarterfinal. Smyczek (pronounced SMEE-check) rallied from a 4-0 deficit in the final set and beat 17-year-old Jared Donaldson, one of the United States' top prospects, 2-6, 7-6 (3), 7-5 in 2 hours, 27 minutes. After Donaldson held for 5-3 in the third set, Smyczek won 16 of the last 17 points, including the final 14. He also overcame a 4-2 deficit in the second set. Giron, who's listed at 5-foot-11 (1.80 meters) but looks smaller, turned pro after winning the NCAA crown as a UCLA junior in May. Klahn, a 6-foot (1.83-meter) left-hander who has battled injuries this year, captured the 2010 NCAA title and graduated from Stanford in 2012. Giron will meet qualifier Nils Langer of Germany in today's first quarterfinal at 11 a.m., followed by Smyczek vs. John Millman of Australia. Millman dismantled lucky loser Liam Broady of Great Britain 6-1, 6-2 in a 10 a.m. match after crushing Chase Buchanan, the 2012 NCAA doubles champion with Ohio State teammate Blaz Rola, 6-0, 6-0 in the first round. "The conditions here are super slow, especially in that 10 o'clock time slot," Millman observed. "There's not a lot of heat on the court, and these balls ... you're playing with soccer balls out there. "It becomes pretty hard to play through the conditions. The harder you try to play through the conditions, the more frustrated you're going to get because you're not getting much pace off the racket and the balls aren't doing much off the court. I was just telling myself to play with the conditions as opposed to playing through them." Smyczek is 1-0 against Millman, winning 6-3, 7-5 in the second round of qualifying on grass in Halle, Germany, in 2012 on the elite ATP World Tour. "They nearly didn't let me start the match because I had the wrong-soled shoes on," Millman recalled with a chuckle. "They didn't like the shoes I was wearing. They thought they'd rip up the court too much." Then Millman joked about the hardcourts in Tiburon, "I'll check with Keith (USTA supervisor Keith Crossland) and (make sure) these are fine." Millman played the first two rounds of qualifying in Halle with his shoes, "but if I won, they weren't going to let me on the court," he said. Smyczek, only 5-foot-9 (1.75 meters), is ranked No. 101 in the world after reaching a career-high No. 73 last November. "Obviously, he's a high-quality player," said Millman, who's fighting his way back up the rankings after undergoing shoulder surgery in July last year. "He's been in and out of the top hundred, and you don't do that by fluke. You do that because you're a very good player. "He returns extremely well. He's not the tallest guy, so he's developed some really good returns because he probably doesn't win as many free points on his serve, although he's still got a good serve. On groundstrokes, he's really solid on the forehand and backhand wing, and he's very quick. He doesn't have a lot of holes. I expect a really tough match." John Millman, Australia, def. Liam Broady, Great Britain, 6-1, 6-2. Marcos Giron, United States, def. Bradley Klahn (3), United States, 7-6 (3, 7-6 (1). Nils Langer, Germany, def. John-Patrick Smith, Australia, 7-6 (3), 7-5. Tim Smyczek (2), United States, def. Jared Donaldson, United States, 2-6, 7-6 (3), 7-5. Carsten Ball and Matt Reid, Australia, def. Sekou Bangoura and Vahid Mirzadeh (4), United States, 6-3, 6-3. Chase Buchanan and Tennys Sandgren, United States, def. James Cluskey, Ireland, and Frederik Nielsen (3), Denmark, 5-7, 6-4 [10-4]. Marcus Daniell and Artem Sitak (1), New Zealand, def. Thomas Fabbiano and Luca Vanni, Italy, 6-4, 7-5. Bradley Klahn, United States, and Adil Shamasdin (2), Canada, def. Julio Peralta, Chile, and Matt Seeberger, Los Altos, 7-5, 6-3. Nils Langer, Germany, vs. Marcos Giron, United States. Tim Smyczek (2), United States, vs. John Millman, Australia. Sam Querrey (1), United States, vs. James McGee, Ireland (not before 3 p.m.). Marcus Daniell and Artem Sitak (1), New Zealand, vs. Carsten Ball and Matt Reid, Australia. Bjorn Fratangelo, United States, vs. Matt Reid, Australia. TIBURON, Calif. -- Apparently, it's a generational thing. U.S. Davis Cup veteran Sam Querrey, who turned 27 on Tuesday, said today it's "fine" that Spain recently appointed Gala Leon as the first female captain (Davis Cup lingo for coach) in the 114-year history of the prestigious international men's competition. But Tom Gullikson, a 63-year-old former U.S. Davis Cup captain who's coaching Querrey part-time, called it "strange." Querrey, the top seed in this week's $100,000 First Republic Bank Tiburon Challenger, hadn't heard the news about Leon. But after dispatching countryman Rhyne Williams 6-3, 6-2 in 57 minutes to reach the quarterfinals at the Tiburon Peninsula Club, Querrey thought for a moment and opined: "I think it's fine. She's got a lot of guys to pick from, and I'm sure she'll do a good job. I'm sure it'll be a little different at first, but we've kind of seen it with (Amelie) Mauresmo coaching (Andy) Murray." Gullikson came to Tiburon, a wealthy enclave across the bay from Querrey's native San Francisco, for the first time this week. He had heard about the selection of the 40-year-old Leon, who reached a career-high No. 27 on the women's tour in 2000. Tom Gullikson, a USTA coach and former U.S.
pick a woman to lead a men's team. "Very interesting choice because Spain has had so many great former players who would probably be well qualified from their playing days to be the captain," said Gullikson, a lead national coach for the USTA. "I'm not really privy to the why and the how, so I wouldn't want to speculate why they hired her. "It probably wouldn't be my first choice if I was hiring a Davis Cup captain. Even in Fed Cup (the women's version of the Davis Cup), I think it's better to hire a female coach. They know women's tennis, and they've been in the women's locker room. It just makes sense to me. Strange hire, I think." Toni Nadal, Rafael's coach and uncle, strongly opposes the choice of Leon. He argues that she poses logistical problems in the locker room and "doesn't know men's tennis." But as the esteemed Jon Wertheim of Sports Illustrated noted in his Sept. 24 Tennis Mailbag at si.com, Toni Nadal "never played at a competitive level, male or female, yet grasps the game just fine." Similarly, Querrey dismissed concerns about the locker room and Gala's knowledge of men's tennis. "You don't always have to stay in the locker room," said Querrey, who has won 14 straight matches since losing to top-ranked Novak Djokovic in the third round of the U.S. Open. "You can change in the locker room and then go to a common room and hang out there. That's what we do a lot of times anyway, so I don't think that's a huge issue. "She hasn't played (men's tennis), but I'm sure she watches it a lot. I'm sure she's up to date on how the men play, the strategy, things like that. I'm sure they asked her those questions and (about) her philosophy before hiring her." Gullikson, who led the United States to the 1995 Davis Cup title, disagreed about Leon's ability to coach men, even though men commonly work with women on the WTA tour. Men's and women's tennis, Gullikson said, "are different sports. I think both the women and the men would say that. Men are men, and women are women. We're different. The men play a lot different than the women. They're different emotionally as well. "The men can really dominate a match with their serve and forehand, and (they're) obviously very athletic.They can hit amazing shots when they're off balance and out of position. The top four or five players also can defend the court incredibly well. Outside the doubles lines, they can still defend the ball and even hit good shots. "Serena (Williams) dominates the women's tour with her serve. She's got a lot of power and a lot of weapons, but you look at somebody like (Caroline) Wozniacki, who was No. 1 in the world without ever winning a Slam, and she really doesn't make winners. She wins on other girls' mistakes, and she's very consistent and competes well. Obviously, she's had a nice run this summer, getting to the final of the (U.S.) Open, but she doesn't have the power to win points like the guys do." Gullikson -- who has coached Jim Courier, Todd Martin, Jennifer Capriati and CoCo Vandeweghe, among other men and women -- added that "the women get a little more emotional than the guys do, in my experience." Maybe it doesn't matter who serves as a nation's Davis Cup captain. As Wertheim wrote: "Davis Cup captaincy is not exactly a deep dive into the inner works of tennis. The job requirements: Pick a lineup, go to some ITF dinners and, once you learn the ins and outs, tell players Vamos on changeovers." --On-court coaching, which is allowed on the WTA tour but not the men's ATP World Tour. "I'm not a big fan of on-court coaching in the WTA events. It makes it look like the girls can't figure it out themselves. That's wrong because most of the girls who get into the top 100 know how to play, construct points and compete. Otherwise, they wouldn't be there. Figuring out how to play and being responsible for your own tennis is a big part of growing and maturing as a player. "I hate it when players have to look at their coach after every point for either approval or some hand signal of what to do next. I don't believe in that. Twin brother Tim (Gullikson) coached Pete Sampras for five years until he got stricken with the brain cancer (and died in 1996). Pete never looked up at Tim. Tim would yell encouragement from the stands, but (Sampras) knew how to play and handle different situations on the court. "If you do a good enough job coaching, your players should be ready to handle anything that happens on the court. They should be ready for any kind of contingency and be able to change tactics and patterns themselves." --Whether there has been a changing of the guard in men's tennis this year. "I think it's healthy. When you see all the same guys winning all the Slams, as great of tennis players as they are and as good as the story lines are, I think it's healthy for the sport when other people come up and break through." --Whether Roger Federer, 33, will add to his record 17 Grand Slam singles titles. "I hope so. I'd love to see him win one more. I think his best chance is at Wimbledon on the grass because that's where his slice backhand is most effective. Of all the top players, he is by far the best volleyer. And working with Stefan Edberg, who volleyed unbelievably well, I'm sure Stefan is encouraging Roger as he gets older to shorten the points and try to win more points at the net." --Whether the struggling United States has any potential Grand Slam champions in men's singles. "We have a lot of good young players. The birth year '96, '97 and '98, I think we've got the best players in the world at that age. This year, we had (seven) kids in the round of 16 at (junior) Wimbledon and three of the four semifinalists. "Young Jared Donaldson is doing well here, Stefan Kozlov got to the final last week in Sacramento, Francis Tiafoe won the Orange Bowl last year, and Taylor Fritz from Southern Cal has done pretty well in some of the Futures events." --American Jack Sock, who's ranked 60th in the world at age 22. "Sock beat Nishikori today in the second round in Shanghai. He's starting to have some signature wins. That's his first win over a top-10 player. "So, yeah, there's light at the end of the tunnel." Bjorn Fratangelo, United States, def. Louk Sorensen, Ireland, 4-6, 7-5, 6-4. Matt Reid, Australia, def. Fritz Wolmarans, South Africa, 6-2, 5-7, 6-3. James McGee, Ireland, def. Jordan Thompson, Australia, 7-6 (0), 6-3. Sam Querrey (1), United States, def. Rhyne Williams, United States, 6-3, 6-2. James Cluskey, Ireland, and Frederik Nielsen, Denmark, def. Adam Hubble and John-Patrick Smith, Australia, 2-6, 6-3 [10-5]. Thomas Fabbiano and Luca Vanni, Italy, def. Alex Bolt, Australia, and Frank Dancevic, Canada, 6-4, 6-2. Chase Buchanan and Tennys Sandgren, United States, def. Nils Langer, Germany, and Louk Sorensen, Ireland, 5-1, retired. Sekou Bangoura and Vahid Mirzadeh, United States, def. Sebastian Bader, Austria, and Erik Elliott, United States, 5-7, 6-4 [10-8]. Carsten Ball and Matt Reid, Australia, def. Thiemo de Bakker and Wesley Koolhof, Netherlands, 6-3, 7-6 (4). Bradley Klahn, United States, and Adil Shamasdin (2), Canada, def. Dennis Novikov, San Jose, and Greg Ouellette, United States, 4-6, 6-1 [10-5]. John Millman, Australia, vs. Liam Broady, Great Britain. Bradley Klahn (3), United States, vs. Marcos Giron, United States. (not before noon). Tim Smyczek (2), United States, vs. Jared Donaldson, United States (not before 3 p.m.). Bradley Klahn, United States, and Adil Shamasdin (2), Canada, vs. Julio Peralta, Chile, and Matt Seeberger, Los Altos (not before 4:30 p.m.). Marcus Daniell and Artem Sitak (1), New Zealand, vs. Thomas Fabbiano and Luca Vanni, Italy. James Cluskey, Ireland, and Frederik Nielsen, Denmark, vs. Chase Buchanan and Tennys Sandgren, United States. John-Patrick Smith, Australia, vs. Nils Langer, Germany (not before 1:30 p.m.). Sekou Bangoura and Vahid Mirzadeh (4), United States, vs. Carsten Ball and Matt Reid, Australia. Challenger two weeks ago, pulled out with a right wrist injury. Defending champion Peter Polansky, a right-hander from Canada, withdrew from the $100,000 First Republic Bank Tiburon Challenger today with a right wrist injury. Polansky, 26, will tumble from No. 126 in the world to about No. 158. Fritz Wolmarans of South Africa replaced Polansky in the draw and upset Wayne Odesnik of Fort Lauderdale, Fla., 4-6, 7-6 (3), 6-2 in the first round. Odesnik retired from his second-round matches in the Napa and Sacramento Challengers in the past two weeks with an inflamed left big toe. He is ranked No. 170 and Wolmarans No. 451. Both are 28 years old. The top three seeds -- Sam Querrey, Tim Smyczek and Bradley Klahn, respectively -- advanced in straight sets, but Nos. 4-8 are already out. Querrey, who was born across the bay in San Francisco, turned 27 today. The 6-foot-6 (1.98-meter) Davis Cup veteran, ranked No. 48 after climbing to a career-high No. 17 in 2011, is trying to sweep the three-week Northern California Challenger swing. Klahn, a 24-year-old left-hander, starred at nearby Stanford from 2009 through 2012. John Millman of Australia demolished Chase Buchanan of Columbus, Ohio, 6-0, 6-0 in 45 minutes. Millman, 25, reached the semifinals in Sacramento last week and won the title there in 2010. Buchanan, 23, captured the 2012 NCAA doubles title with Ohio State teammate Blaz Rola. The second round of the Tiburon Challenger features three qualifiers (Matt Reid, Nils Langer and Marcos Giron), two lucky losers (Wolmarans and Liam Broady) and two wild cards (Bjorn Fratangelo and 17-year-old Jared Donaldson). John Millman, Australia, def. Chase Buchanan, United States, 6-0, 6-0. Marcos Giron, United States, def. Alex Bolt, Australia, 6-0, 6-3. Liam Broady, Great Britain, def. Frank Dancevic (7), Canada, 6-3, 7-6 (3). Bradley Klahn (3), United States, def. Tennys Sandgren, United States, 6-4, 7-6. Matt Reid, Australia, def. Tom Fawcett, United States, 7-5, 7-5. Nils Langer, Germany, def. Thiemo de Bakker (6), Netherlands, 6-1, 6-3. Sam Querrey (1), United States, def. Daniel Nguyen, United States, 6-1, 6-4. Jared Donaldson, United States, def. Dennis Novikov, San Jose, 6-3, 6-2. John-Patrick Smith, Australia, def. Thomas Fabbiano, Italy, 6-1, 6-4. Fritz Wolmarans, South Africa, def. Wayne Odesnik, United States, 4-6, 7-6 (3), 6-2. Tim Smyczek (2), United States, def. Ryan Harrison, United States, 6-3, 6-3. Marcus Daniell and Artem Sitak (1), New Zealand, def. Denis Kudla and Rhyne Williams, United States, 6-2, 6-0. Bjorn Fratangelo, United States, vs. Louk Sorensen, Ireland. Matt Reid, Australia, vs. Fritz Wolmarans, South Africa (not before 11:30 a.m.). James McGee, Ireland, vs. Jordan Thompson, Australia (not before 2 p.m.). Sam Querrey (1), United States, vs. Rhyne Williams, United States (not before 4 p.m.). Adam Hubble and John-Patrick Smith, Australia, vs. James Cluskey, Ireland, and Frederik Nielsen (3), Denmark. Nils Langer, Germany, and Louk Sorensen, Ireland, vs. Chase Buchanan and Tennys Sandgren, United States. Bradley Klahn, United States, and Adil Shamasdin (2), Canada, vs. Dennis Novikov, San Jose, and Greg Ouellette, United States (not before 3 p.m.). Alex Bolt, Australia, and Frank Dancevic, Canada, vs. Thomas Fabbiano and Luca Vanni, Italy. Sekou Bangoura and Vahid Mirzadeh, United States, vs. Sebastian Bader, Austria, and Erik Elliott, United States. Carsten Ball and Matt Reid, Australia, vs. Thiemo de Bakker and Wesley Koolhof, Netherlands. After one day, the $100,000 First Republic Bank Tiburon Challenger looks a lot like last week's $100,000 Sacramento Pro Circuit Challenger. Both seeds in action at the Tiburon Peninsula Club lost on Monday. And both are in top-seeded Sam Querrey's half of the draw. Not that the 6-foot-6 (1.98-meter) U.S. Davis Cup veteran, ranked 48th in the world after reaching a career-high No. 17 in 2011, needs any help. Jordan Thompson, 20, of Australia ousted fifth-seeded Denis Kudla of Boca Raton, Fla., 6-7, 6-3, 6-4. Kudla advanced to last year's semifinals as the top seed before losing to third-seeded Matthew Ebden of Australia. Also Monday, Louk Sorensen of Ireland outlasted eighth-seeded Luca Vanni of Italy 6-3, 5-7, 7-5. The other seed in the top half of the draw -- No. 4 Peter Polansky, the defending champion from Canada -- will open against Wayne Odesnik of Fort Lauderdale, Fla., today. Ten other matches will complete the first round. After the opening round in Sacramento, Querrey was the only remaining seed in the top half. He went on to win his second Challenger title in two weeks. The Tiburon crown would give Querrey, who has a 12-match winning streak, a sweep of the three-week Northern California swing that began in Napa. to 6-foot-11 (2.11-meter) Ivo Karlovic in singles and with countryman Steve Johnson to Australians Carsten Ball and Chris Guccione in doubles. Matt Reid (1), Australia, def. Fritz Wolmarans, South Africa, 6-3, 3-6, 6-3. Nils Langer (3), Germany, def. Sekou Bangoura, United States, 6-3, 6-4. Dennis Novikov (4), San Jose, def. Mico Santiago, United States, 6-3, 6-4. Marcos Giron (7), United States, def. Liam Broady (2), 6-3, 5-7, 6-2. Bjorn Fratangelo, United States, def. Alex Kuznetsov, United States, 6-4, 6-4. Rhyne Williams, United States, def. Elias Ymer, Sweden, 6-4, 1-6, 6-1. Louk Sorensen, Ireland, def. Luca Vanni (8), Italy, 6-3, 5-7, 7-5. James McGee, Ireland, def. Kyle Edmund, Great Britain, 3-6, 6-3, 6-3. Jordan Thompson, Australia, def. Denis Kudla (5), United States, 5-7, 6-3, 6-4. Julio Peralta, Chile, and Matt Seeberger, Los Altos, def. Collin Altamirano, Sacramento, and Deiton Baughman, United States, 6-4, 6-1. John Millman, Australia, vs. Chase Buchanan, United States. Bradley Klahn (3), United States, vs. Tennys Sandgren, United States. Sam Querrey (1), United States, vs. Daniel Nguyen, United States (not before 2 p.m.). Tim Smyczek (2), United States, vs. Ryan Harrison, United States (not before 4 p.m.). Alex Bolt, Australia, vs. Marcos Giron, United States. Matt Reid, Australia, vs. Tom Fawcett, United States. Jared Donaldson, United States, vs. Dennis Novikov, San Jose. Marcus Daniell and Artem Sitak (1), New Zealand, vs. Denis Kudla and Rhyne Williams, United States (not before 3 p.m.). Frank Dancevic (7), Canada, vs. Liam Broady, Great Britain. Thiemo de Bakker (6), Netherlands, vs. Nils Langer, Germany. John-Patrick Smith, Australia, vs. Thomas Fabbiano, Italy. Peter Polansky (4), Canada, vs. Wayne Odesnik, United States. SACRAMENTO, Calif. -- Sam Querrey emphatically ended Stefan Kozlov's amazing run in the $100,000 Sacramento Pro Circuit Challenger but predicted stardom for the 16-year-old wild card. The top-seeded Querrey, a 6-foot-6 (1.98-meter) Davis Cup veteran who has been ranked as high as No. 17 in the world, overpowered Kozlov 6-3, 6-4 on Sunday for the title at the Natomas Racquet Club. "He's got every shot in the book," marveled Querrey, who has practiced often with Kozlov but had never played him in a match. "If he keeps on the path he's on, he can be a top-10 player one day." By reaching his first Challenger final in only his third attempt, Kozlov soared from No. 763 to No. 443. That makes Kozlov, a resident of Pembroke Pines, Fla., in the Miami area who was named after Stefan Edberg, the youngest player in the top 500. Querrey, meanwhile, has won 12 straight matches since losing to top-ranked Novak Djokovic 6-3, 6-2, 6-2 in the third round of the U.S. Open. Not that it mattered, but Querrey did not face a seed in the Sacramento Challenger. Querrey, who captured the $50,000 Napa Valley Challenger the week before Sacramento, will try to sweep the Northern California swing in this week's $100,000 First Republic Bank Tiburon Challenger at the Tiburon Peninsula Club. swing by winning the $100,000 Tiburon Challenger. "It'd be great," said Querrey, who was born across the bay from Tiburon in San Francisco. "A win's a win. It doesn't matter what level. I feel good right now, feel confident, and I'm already looking forward to next week." Kozlov was entered in Tiburon but decided to rest after his tiring week in Sacramento, where the temperature climbed to 95 degrees (35 Celsius). "I'm pretty beat up," said the 5-foot-10 (1.78-meter) Kozlov, who showed remarkable mental toughness by winning his four previous matches in the tournament in three sets. Kozlov's next tournament will be in two weeks on an indoor hardcourt in Valencia, Spain. He received a wild card in the tournament on the ATP World Tour, the major leagues of men's tennis. Challengers are comparable to Triple A in baseball. Querrey fell one spot to No. 48 despite winning the Sacramento title because he reached the quarterfinals in Beijing on the ATP tour during the corresponding week last year. The ranking points he earned for that result were replaced on the computer by his Sacramento points. Querrey's goal for the rest of the year is to raise his ranking to No. 32 or better so he can be seeded in the Australian Open in January. That would prevent him from meeting another seed -- hello Djokovic, Rafael Nadal, Roger Federer, Andy Murray, et al. -- in at least the first two rounds. "I want to just put myself in good position for the start of next year," said Querrey, who will turn 27 on Tuesday. Querrey was ranked No. 19 as recently as July 2013 but suffered an abdominal injury last October and a devastating loss to No. 175 James Ward in the United States' 3-1 upset loss to Great Britain in the first round of the Davis Cup in San Diego in February. Querrey decided the play in the Northern California Challengers for several reasons. He grew up in the state and lives in Las Vegas, he would have had to qualify for the ATP tournaments in Asia, and he didn't want to travel there without a coach. Querrey split with David Nainkin earlier this year and hasn't replaced him. In Sunday's final, Kozlov broke serve for a 3-2 lead in the first set, but Querrey reeled off the next four games for the set. Querrey recorded the only break of the second set to lead 4-3. From 30-30, Kozlov double-faulted and hit a risky drop shot that Querrey slugged for a forehand cross-court passing shot. Querrey closed the match with two of his 13 aces. He committed only one double fault and won 84 percent of the points on his first serve. "I had a little bit of a slow start, but I felt a lot of pressure out there," Querrey admitted. "He's a tough 16-year-old player, he'll get better and better as the years go on, and I thought he had a great tournament to make the finals. I'm happy to win and get through." Lamented Kozlov, who was born in Macedonia to Russian parents and moved to South Florida at 1: "It just wasn't clicking today. He didn't give me any rhythm; he was serving really well. I gave him a couple of (service) breaks, and that was enough." Querrey's check for $14,400 amounts to pocket change for a player who has amassed more than $5.7 million since turning pro out of Thousand Oaks High School in the Los Angeles area in 2006. Kozlov took home $8,480. Unseeded Adam Hubble and John-Patrick Smith of Australia beat second-seeded Peter Polansky and Adil Shamasdin of Canada 6-3, 6-2 for the doubles title. Smith also won last year's doubles crown with countryman Matt Reid. Polansky and Shamasdin were seeking their third straight title after winning in Napa and Lexington, Ky., in July. SACRAMENTO, Calif. -- Stefan Kozlov has pulled off more amazing escapes than Houdini this week. Kozlov, a 16-year-old wild card, somehow managed to stun No. 2 seed and fellow American Tim Smyczek 3-6, 6-3, 7-6 (1) on Saturday in the semifinals of the $100,000 Sacramento Pro Circuit Challenger. Kozlov recorded his first victory over a top-100 player -- Smyczek (pronounced SMEE-check) is No. 99 -- and reached his first Challenger final in only his third attempt. He will face top-seeded Sam Querrey, a San Francisco native and former Sacramento Capital in World TeamTennis, today after the 10:30 a.m. doubles final. Querrey beat unseeded John Millman of Australia 5-7, 6-4, 6-3 for his 11th straight victory since losing to top-ranked Novak Djokovic in straight sets in the third round of the U.S. Open. Millman, the 2010 Sacramento champion, returned to competition in April after missing 11 months because of shoulder surgery. Kozlov has won all four of his matches at the Natomas Racquet Club in three sets, and each battle has been closer than the last. --Tightness in his right elbow that almost caused him to retire from the match. --A ball accidentally drilled at him at the net. It missed Kozlov. --A collision with a fence. --Three game points for Smyczek to lead 4-1 (one service break) in the third set. --Two break points at 3-4 in the third set. If Smyczek had converted either, he would have served for the match. --A cramp in his left quadricep in the 3-4 game. It was the tennis version of being locked in handcuffs and leg irons, placed in a nailed box with ropes tied around it and lowered into a river. No way Kozlov gets out of his predicament. "That just shows you how much heart I have out there," Kozlov explained. "I didn't quit on one point. At 3-1, 40-0 (for Smyczek) to go up 4-1 in the third, I honestly thought the match was over if he would have held there. But I showed a lot of heart and somehow got back in that game and got back in the match." Kozlov said he gets his determination from his Russian father. Andrei and Larissa Kozlov moved to the Southeastern European country of Macedonia, where Stefan was born, in search of better tennis opportunities and to South Florida when Stefan was 1. Stefan and his 14-year-old brother were named after International Tennis Hall of Famers Stefan Edberg and Boris Becker, respectively. Andrei runs the Kozlov Tennis Academy in Pembroke Pines, a suburb of Miami. "We don't live in the biggest house or have the nicest cars," admitted Stefan, who speaks fluent Russian. "We grind day by day. If I do well here, I'm earning money for my family and my brother so he can travel to tournaments. "I'm not playing for myself. I'm playing for my family. I'm playing for a lot of things." Kozlov, who turned pro at 14, added that he has two major endorsement contracts but wouldn't say how much they're worth. Some of the money is guaranteed and some is based on incentives, he said. The winner of the Challenger, equivalent to Triple A in baseball, will collect $14,400 and the runner-up $8,480. Kozlov prevented Smyczek from reaching his second consecutive Sacramento Challenger final. He lost last year to Donald Young, who played in Tokyo on the elite ATP World Tour this week and lost to U.S. Open runner-up Kei Nishikori in the second round. "I got off to a good start and then just wasn't able to maintain it the rest of the day," said Smyczek, 26. "He kind of took me out of my game a little bit, and I never really found it after the first set. "He plays a real unconventional style ... He uses the slice a lot -- (including on) the forehand, which you don't see much -- and he's good at sneaking into the net and knocking volleys off. You don't see the variety that he brings very much." Kozlov will skyrocket from No. 763 in the world to approximately No. 450 if he loses to Querrey and to about No. 350 if he pulls off another upset. Kozlov will go from playing one of the smallest players on the tour to one of the biggest. Smyczek is 5-foot-9 (1.75 meters) and Querrey 6-foot-6 (1.98 meters). Querrey, ranked No. 47 after reaching a career-high No. 17 in 2011, will try to win his second Challenger title in two weeks. The 26-year-old U.S. Davis Cup veteran routed Smyczek for the $50,000 Napa Challenger. Although he has never played Kozlov, Querrey said: "I know him well. I've hit with him a bunch. He's a great talent. ... I'm going to have to play well to beat him. He makes you win points." Querrey blasts serves at up to 141 mph (227 kph) and bludgeons his forehand, but Kozlov is not fazed by power. He extended Australian Sam Groth, who holds the record of 163.7 mph (263.4 kph), to 6-4 in the third set in the first round of qualifying in Washington, D.C., on the ATP tour in July and eliminated hard-hitting Ryan Harrison in the first round of the Sacramento Challenger. Stefan Kozlov, United States, def. Tim Smyczek (2), United States, 3-6, 6-3, 7-6 (1). Sam Querrey (1), United States, def. John Millman, Australia, 5-7, 6-4, 6-3. Adam Hubble and John-Patrick Smith, Australia, def. Marcus Daniell and Artem Sitak (1), New Zealand, 6-4, 6-7 (5) [16-14]. Peter Polansky and Adil Shamasdin (2), Canada, vs. Adam Hubble and John-Patrick Smith, Australia. Sam Querrey (1), United States, vs. Stefan Kozlov, United States (not before 12:30 p.m.).